Grants, fundraising events and gallery sales only cover a portion of the funds needed for daily operations at STARworks. Your support is a vital part of the creative process. Provides outstanding artistic educational programs and business ventures to regions that can often feel like a cultural desert. Gives young aspiring artists the ability to participate in an after school program that gives local students the opportunity to learn from working artists, and expand on team-building skills, critical thinking exercises and communication skills. Supports innovative programs like the new STARworks Design Residency that gives designers and artists the opportunity to work together to develop high equaling products for the home. These programs will create jobs and new creative businesses. Brings cultural diversity and economic development to small communities. As a thank you for your support, we offer the following donor rewards. Friend Level ($5/month or one-time $50 donation) - Receive our weekly e-newsletter about events in central North Carolina and invitations to our Annual Gathering in October. Supporter Level ($10/month or one-time $100 donation) - Receive the benefits listed above plus recognition at the Annual Gathering. Contributor Level ($23/month or one-time $250 donation) - Receive all the benefits listed above plus exclusive invitations to Pumpkin Patch, and Holiday Ornament preview parties, and other donor appreciation events. Sustainer Level ($45/month or one-time $500 donation) - Receive all the benefits listed above plus a 10% discount on STARworks classes, workshops and STARworks-made products throughout the year. Patron Level ($85/month or one-time $1,000 donation) - Receive all the benefits listed above plus a special hand-blown glass that you can bring with you to every Hot Glass Cold Beer event during the year and drink for free. You will also receive recognition in our Annual Gathering program. Sponsor Level ($220/month or one-time $2,500 donation) - Receive all the benefits listed above plus the opportunity to participate in a hands-on glass, ceramic or metal workshop of your choosing. 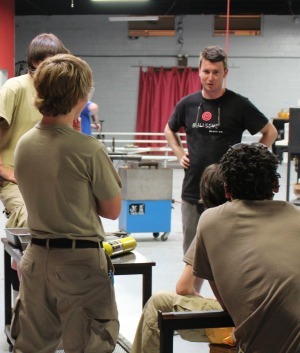 STARworks Glass Director Joe Grant instructs students from Eckerds Kids, a juvenile justice residential program that affords second chances to boys ages 13-17 by offering rehabilitative services that help them change their behavior by building on their strengths.